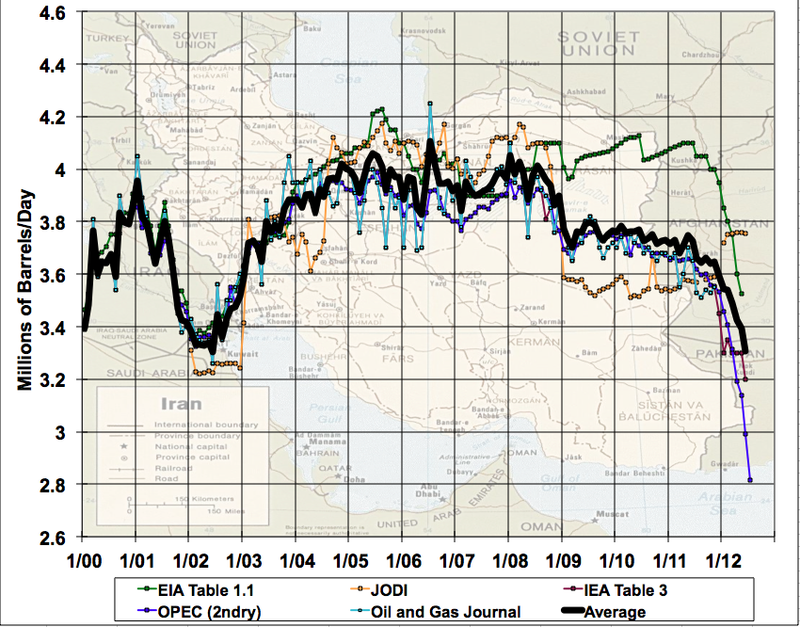 We have data through July from OPEC secondary sources and through June for most other sources. The result looks as above (graph not zero-scaled to better show changes). Iranian production has been falling noticeably for a number of months and is now down by about a sixth of the pre-sanctions level. 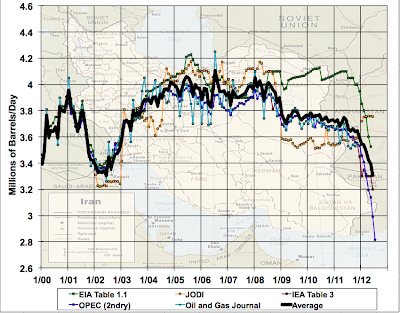 This ignores the possibility that Iraq is helping Iran to smuggle oil. So the sanctions are definitely biting - revenue will likely have dropped much more than production (since only a fraction of production is exported and prices paid will have dropped as Iran's few remaining customers use their leverage to extract price concessions). Still, the Iranian response has been to double down on nuclear enrichment. So sanctions are not, thus far, achieving the desired end goal. "Iranian response has been to double down on nuclear enrichment. So sanctions are not, thus far, achieving the desired end goal." Sort of surprised you say that, being an oil guy. Nuclear enrichmentis just a stick to beat them with not an end, I doubt the US thinks twice about Iran developing weapons grade uranium. Of course if you are suggesting that the US wishes to incite Iran to a hasty action, for instance like closing the Strait of Hormuz, I would go along with that. Then we can all sing with the Fish, one more time, some lyrical changes but same old Zhit.